This ingenious device will cure most smoking problems resulting from a flue sized too small for the fireplace opening. 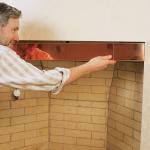 The smoke guard can be used to reduce the height or width of the fireplace, making the ratio of the fireplace opening to flue size more compatible. Spring loaded to adjust to different sizes so it Installs easily without tools. 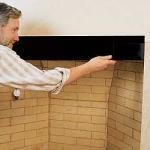 Fits fireplaces from 28" to 48" in width.